Not to be confused with Melitene. Mytilene (Greek: Μυτιλήνη Mytilini [mitiˈlini]) is a city founded in the 11th century BC. Mytilene is the capital city and port of the island of Lesbos and also the capital of the North Aegean Region. The seat of the governor of the North Aegean Region is Mytilene. 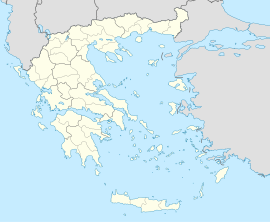 Mytilene is also one of 13 municipalities (counties) on the island of Lesbos. Mytilene is built on the southeast edge of the island. It is also the seat of a metropolitan bishop of the Eastern Orthodox Church. Pittacus of Mytilene (c. 640 - 568 BC), one of the Seven Sages of Greece; woodcut from the Nuremberg Chronicle. As an ancient city, lying off the east coast, Mytilene was initially confined to a small island just offshore that later was joined to Lesbos, creating a north and south harbor. The early harbors of Mytilene were linked during ancient times by a channel 700 meters long and 30 meters wide. The Roman writer Longus speaks of white stone bridges linking the two sides. The Greek word εὔριπος eúripos is a commonly-used term when referring to a strait. The strait allowed ancient warships called triremes, with three tiers of rowers or more. The boats that passed were ca. six meters wide plus oars and had depth of two meters. The areas of the city that were densely populated connected the two bodies of land with marble bridges. They usually followed a curved line. The strait begins at the old market called Apano Skala. It was also close to Metropolis Street and ended at the Southern Harbor. One could argue that the channel transversed what is now called Ermou Street. Over time the strait began to collect silt and earth. There was also human intervention for the protection of the Castle of Mytilene. The strait eventually filled with earth. Mytilene contested successfully with Mithymna in the north of the island for the leadership of the island in the seventh century BC and became the centre of the island’s prosperous eastern hinterland. Her most famous citizens were the poets Sappho and Alcaeus and the statesman Pittacus (one of the Seven Sages of Greece). The city was famed for its great output of electrum coins struck from the late sixth through mid-fourth centuries BC. The Mytilenean revolt against Athens in 428 BC was overcome by an Athenian expeditionary force. The Athenian public assembly voted to massacre all the men of the city and to sell the women and children into slavery but the next day in the Mytilenian Debate changed its mind. A fast trireme sailed the 186 nautical miles (344 km) in less than a day and brought the decision to cancel the general massacre, but a thousand citizens were executed for taking part in the rebellion. Aristotle lived on Mytilene for two years, 337-335 BC, with his friend and successor, Theophrastus (a native of the island), after being the tutor to Alexander, son of King Philip II of Macedon. The Romans, among whom was a young Julius Caesar, successfully defeated Mytilene in 81 BC at the Siege of Mytilene. Although Mytilene supported the losing side in most of the great wars of the first century BC, her statesmen succeeded in convincing Rome of her support of the new ruler of the Mediterranean and the city flourished in Roman times. In AD 56, Luke the Evangelist, Paul the Apostle and their companions stopped there briefly on the return trip of Paul's third missionary journey (Acts 20:14), having sailed from Assos (about 50 km (31 mi) away). From Mytilene they continued towards Chios (Acts 20:15). The novel Daphnis and Chloe by Longus, is set in the country around it and opens with a description of the city. Scholar and historian Zacharias Rhetor, also known as Zacharias of Mytilene was from Mytilene and lived from 465 to around 536. He was made Bishop of Mytilene and may have been a Chalcedonian Christian. He either died and or was deposed around 536 and 553. The city of Mytilene was also home to ninth-century Byzantine saints who were brothers, Archbishop George, Symeon Stylites, and David the Monk. The Church of St. Symeon, Mytilene venerates one of the three brothers. Catching the eye of the Empress Zoë Porphyrogenita, Constantine IX Monomachos was exiled to Mytilene on the island of Lesbos by her second husband, Michael IV the Paphlagonian. The death of Michael IV and the overthrow of Michael V in 1042 led to Constantine being recalled from his place of exile and appointed as a judge in Greece. Lesbos and Mytilene had an established Jewish population since ancient times. In 1170, Benjamin of Tudela found ten small Jewish communities on the island. In the Middle Ages, it was part of the Byzantine Empire and was occupied for some time by the Seljuqs under Tzachas in 1085. In 1198, the Republic of Venice obtained the right to commerce from the city's port. In the 13th century, it was captured by the Emperor of Nicaea, Theodore I Laskaris. In 1335, the Byzantines, with the help of Ottoman forces, reconquered the island, then property of the Genoese nobleman Domenico Cattaneo. In 1355, emperor John V Palaiologos gave it to the Genoese adventurer Francesco Gattilusio, who married the emperor's sister, Maria. They renovated the fortress in 1373, and it remained in Genoese hands until 1462, when it was besieged and captured by the Ottoman sultan Mehmed the Conqueror. Mytilene along with the rest of Lesbos remained under Ottoman control until the First Balkan War in 1912, when in November it became part of the Kingdom of Greece. Mytilene is located in the southeastern part of the island, north and east of the Bay of Gera. It has a land area of 107.46 square kilometres (41.49 sq mi) and a population of 36,196 inhabitants (2001). With a population density of 336.8/km² it is by far the most densely populated municipal unit in Lesbos. The next largest towns in the municipal unit are Vareiá (pop. 1,254), Pámfila (1,247), Mória (1,207), and Loutrá (1,118). The Greek National Road 36 connects Mytilene with Kalloni. Farmlands surround Mytilene, the mountains cover the west and to the north. The airport is located a few kilometres south of town. Since the 2011 local government reform, the cities and towns within the municipality changed. The province of Mytilene (Greek: Επαρχία Μυτιλήνης) was one of the provinces of the Lesbos Prefecture. Its territory corresponded with that of the current municipal units Mytilene, Agiasos, Evergetoulas, Gera, Loutropoli Thermis, Mantamados and Polichnitos. It was abolished in 2006. Mytilene has a port with ferries to the nearby islands of Lemnos and Chios and Ayvalık and at times Dikili in Turkey. The port also serves the mainland cities of Piraeus, Athens and Thessaloniki. One ship, named during the 2001 IAAF games in Edmonton Aeolos Kenteris, after Kostas Kenteris, used to serve this city (his hometown) with 6-hour routes from Athens and Thessaloniki. The main port serving Mytilene on the Greek mainland is Piraeus. The city produces ouzo. There are more than 15 commercial producers on the island. The city exports sardines harvested from the Bay of Kalloni and olive oil and woodwork. The town of Mytilene has a large number of neoclassical buildings, public and private houses. Some of them are the building of the Lesbos Prefecture, the old City Hall, the Experimental Lyceum and various mansions and hotels all over the town. The Baroque church of Saint Therapon dominates at the port with its impressive style. In 2015 the island of Lesbos began to draw international attention because of what has been popularized as the European refugee crisis. Facing economic crises, oppressive governments, violence, and war, thousands of people from Syria, Afghanistan, Iran, Iraq, Nigeria, Somalia, and other countries have decided to leave their homes and seek safety in Europe. As the capital of Lesbos, the city of Mytilene has become a primary entry point for refugees and migrants who seek to pass through Greece to resettle elsewhere in Europe. A refugee's journey to Mytilene involves a series of strategic steps. Individuals often travel by foot, car, bus, and boat to reach Turkey before taking boats across the Aegean Sea to Lesbos. Mytilene serves as a doorway to the Greek mainland and thus to the European countries, such as the Netherlands, Sweden, and Germany, in which refugees often desire to settle. In the past two years, over half a million people have arrived in Lesbos. Some have drowned on the journey, because of the dangerous nature of traveling by boat without lifejackets and also because they have been sold faulty lifejackets by smugglers. Others have suffered from hypothermia. The number of individuals coming through Lesbos has dwindled since the signing of the controversial EU-Turkey deal which restricted the number of refugees that could legally resettle in Europe. The deal stated that persons arriving in Greece by first traveling through Turkey would, after March 20, 2016, be deported from Greece and sent back to Turkey if Greece did not confer them asylum status. As of July 2017, seventy to eighty refugees are still arriving in Greece daily despite the deal and "many of them on Lesbos", according to Daniel Esdras, the chief of the International Organization for Migration (IOM). Formerly a prison, Moria is a refugee camp located in a village near Mytilene. Enclosed with barbed wire and a chain-link fence, the camp serves as a European Union receiving center or “hotspot”. When refugees first arrive in Mytilene seeking asylum, they must be screened in Moria and cannot be placed into any of the other nearby camps until they are processed there. The camp was built to accommodate around 700 people, though over the past two years,[when?] thousands of people have often arrived in a single month. Because of extreme overcrowding, the camp authorities established makeshift living quarters in an olive grove behind the camp. Human Rights Watch has termed the camp as "unfit for animals". In October 2017, Afghan refugees protested the Moria's poor conditions and the violence prevalent in the camp. Kara Tepe Refugee Camp [Tepe] is a camp in Mytilene, residing on a hill in the northern part of the town. The camp, which was at one time an army shooting range, has been transformed into a living space for around 700 refugees classified as vulnerable. PIKPA camp or Lesvos Solidarity, once a children’s holiday camp, aims to support the most vulnerable refugees who pass through Mytilene: families with children, the disabled, women who are pregnant, and the injured. The camp focuses on humanitarian aid and on providing for the various needs of refugees, including food, medical help, clothing, and psychological support. Archaeological investigations at Mytilene began in the late 19th century when Robert Koldewey (later excavator of Babylon) and a group of German colleagues spent many months on the island preparing plans of the visible remains at various ancient sites like Mytilene. Significant excavations, however, do not seem to have started until after the First World War when in the mid-1920s Evangelides uncovered much of the famous theatre (according to Plutarch it was the inspiration for Pompey's theatre in Rome in 55 BC, the first permanent stone theatre in that city) on the hill on the western side of town. Subsequent work in the 1950s, 1960s and 1970s by various members of the Archaeological Service revealed more of the theatre, including a Roman conversion to a gladiatorial arena. Salvage excavations carried out by the Archaeological Service in many areas of the city have revealed sites going back to the Early Bronze Age although most have been much later (Hellenistic and Roman). Particularly significant is a large stoa over a hundred metres long recently dug on the North Harbour of the city. It is clear from various remains in different parts of the city that Mytilene was indeed laid out on a grid plan as the Roman architect Vitruvius had written. Archaeological excavations carried out between 1984 and 1994 in the Castle of Mytilene by the University of British Columbia and directed by Caroline and Hector Williams revealed a previously unknown sanctuary of Demeter and Kore of late classical/Hellenistic date and the burial chapel of the Gattelusi, the medieval Genoese family that ruled the northern Aegean from the mid-14th to mid-15th centuries of our era. The Demeter sanctuary included five altars for sacrifices to Demeter and Kore and later also to Cybele, the great mother goddess of Anatolia. Among the discoveries were thousands of oil lamps, terracotta figurines, loom weights and other dedications to the goddesses. Numerous animal bones, especially of piglets, also appeared. The Chapel of St. John served as the church of the castle and as a burial place for the Gattelusi family and its dependents. Although conversion to a mosque after the Ottoman capture of the city in 1462 resulted in the destruction of many graves some remained. The great earthquake of February 1867 damaged the building beyond repair and it was demolished; the Turks built a new mosque over the ruins to replace it later in the 19th century. Other excavations done jointly with the 20th Ephorate of Prehistoric and Classical Antiquities near the North Harbour of the city uncovered a multiperiod site with remains extending from a late Ottoman cemetery (including a "vampire" burial, a middle aged man with 20 cm (8 in) spikes through his neck, middle and ankles) to a substantial Roman building constructed around a colonnaded courtyard (probably a tavern/brothel in its final phase in the mid-4th century AD) to remains of Hellenistic structures and debris from different Hellenistic manufacturing processes (pottery, figurines, cloth making and dyeing, bronze and iron working) to archaic and classical levels with rich collections of Aeolic grey wares. A section of the late classical city wall runs across the site which was close to the channel that divided the mainland from the off shore island part of the city. Considerable remains of the two moles that protected the large North Harbour of the city are still visible just below or just breaking the surface of the sea; it functioned as the commercial harbour of the ancient city although today it is a quiet place where a few small fishing boats are moored. The city has two excellent archaeological museums, one by the south harbour in an old mansion and the other two hundred metres further north in a large new purpose built structure. The former contains the rich Bronze Age remains from Thermi, a site north of Mytilene dug by the British in the 1930s as well as extensive pottery and figurine displays; the former coach house accommodates ancient inscriptions, architectural pieces, and coins. The latter museum is especially rich in mosaics and sculpture, including the famous late Roman mosaic floor from the "House of Menander" with scenes from plays by that Athenian 4th-century BC playwright. There are also mosaics and finds from other Roman mansions excavated by the Greek Archaeological Service under the direction of the archeologist Aglaia Archontidou-Argyri. There are 15 primary schools in Mytilene, along with seven lyceums, and eight gymnasiums. There are six university schools with 3671 undergraduates, the largest in the University of the Aegean. Here also is the Rector, the central administration of the Foundation[clarification needed], the Central Library and the Research Committee of Aegean University. The University of Aegean is housed in privately owned buildings, in rented buildings located in the city centre, and in modern buildings on University Hill. Alcaeus and Sappho, Attic red-figure calathus, c.470 BC, Staatliche Antikensammlungen. Alcaeus (6th century BC), Greek poet. Sappho, Ancient Greek Lyric Poet. Plato called her "wise" and "Tenth Muse". Pittacus (c. 640-568 BC), one of the Seven Sages of Greece. Hellanicus (mid-5th century BC), Greek historian. Chares (4th century BC), Greek historian and chamberlain to Alexander the Great. Scamon (4th century BC), Greek historian and son of Hellanicus. Praxiphanes (4th century BC), Greek philosopher. Eunicus, Greek sculptor and silversmith. Hermarchus (3rd century BC), Greek philosopher. Potamon (1st century AD), Greek rhetorician. Lesbonax (1st century BC), Greek sophist and rhetorician. Crinagoras (70 BC-18 AD), Greek epigrammatist and ambassador, poet of "Palatine Poetry". Theophanes, middle of 1st century BC, Greek statesman, close friend of Pompey the Great. Theophrastus, Ancient Greek philosopher, student of Aristotle. Christopher (11th century), Greek poet. Fotis Kontoglou (Aivali, origin of Mytilene) (1895–1965) Greek writer and painter. Panagiotis Polychronis (1854–1941), Greek artist: photographer, lithographist and painter. Sophocles Vournazos (1853–1889), Greek philanthropist and founder of Mytilene's academic buildings. Nicholas Athanasiadis (1904–1990), Greek theatre writer, literature writer, poet. Ioannis Hatzidaniel (1850–1912), Greek painter and photographer. Solon Lekkas, Singer of traditional music from Asia Minor. ^ Thorne, James (2003). Julius Caesar: Conqueror and Dictator. The Rosen Publishing Group. p. 34. ISBN 978-0-8239-3595-6. ^ "MITILINI Climate Normals 1961-1990". National Oceanic and Atmospheric Administration. Retrieved January 29, 2013. ^ "Refugee Flows to Lesvos: Evolution of a Humanitarian Response". migrationpolicy.org. 2016-01-28. Retrieved 2017-12-10. ^ "Fake Life Jackets". The Worldwide Tribe. 2016-01-19. Retrieved 2017-12-10. ^ "Q&A: EU-Turkey refugee deal explained". Middle East Eye. Retrieved 2017-12-10. ^ (www.dw.com), Deutsche Welle. "Violence becoming commonplace in Moria refugee camp | Germany Guide for Refugees | DW | 21.07.2017". DW.COM. Retrieved 2017-12-10. ^ "Greece: Refugee "Hotspots" Unsafe, Unsanitary". Human Rights Watch. 2016-05-19. Retrieved 2017-12-10. ^ "Refugees protest poor conditions in hot spot Moria, Lesvos, and VIAL, Chios". www.keeptalkinggreece.com. Retrieved 2017-12-10. ^ "Lesvos refugee camp transformed by activities, classes, Anthi Pazianou | Kathimerini". Retrieved 2017-12-10. ^ "lesvossolidarity.org". www.lesvossolidarity.org. Retrieved 2017-12-10. ^ D. Gerber, Greek Lyric I: Sappho and Alcaeus (1982). ^ Hellanikos von Mytilene, Die Fragmente der Griechischen Historiker no. 4. ^ Chares von Mytilene, Die Fragmente der Griechischen Historiker no. 125. ^ Skamon of Mytilene, Brill's New Pauly no. 476. ^ F. Wehrli, Phainias von Eresos, Chamaileon, Praxiphanes (1945). ^ F. Longo Aurrichio, Ermarcho. Frammenti (1988). ^ Potamon of Mytilene, Die Fragmente der Griechischen Historiker continued Part IV no. 1085. ^ Theophanes of Mytilene, Brill's New Jacoby no. 188. ^ E. Follieri, I calendari in metro innografico di Cristoforo Mitileneo(1980). Wikimedia Commons has media related to Mytilene.